Over 500 veterans participated in the prayer and cleansing ceremony at Standing Rock. 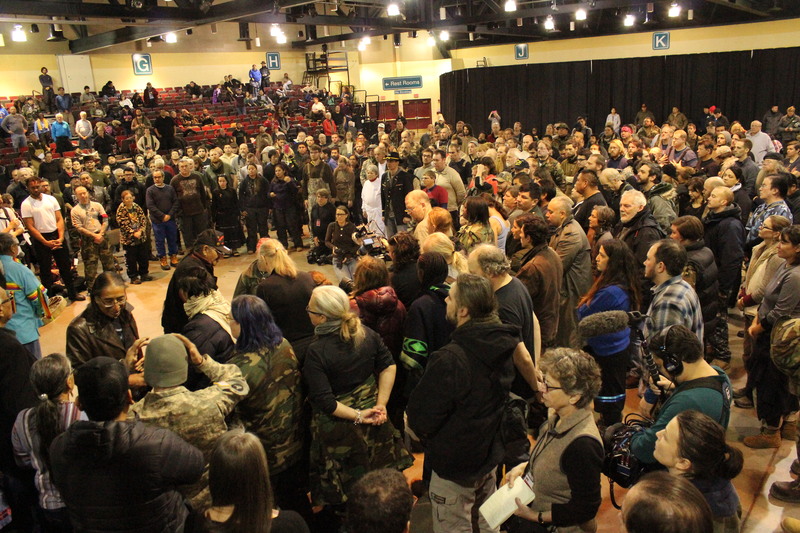 On December 4, 2016, veterans from all across the country began arriving at the Standing Rock Indian Reservation in a gathering organized by Wesley Clark Jr, veteran and son of Wesley Clark, former Supreme Allied Commander Europe NATO. The mission was to protect and serve the water protectors camped out along the Missouri and Cannon Ball rivers as they peacefully protest the Dakota Access Pipeline. Clark Jr. began organizing the event on Facebook, and within three weeks had 2,500 veterans interested in participating. The vets began arriving at camp earlier in the week. Since the Standing Rock Sioux could only accommodate 2,000, Clark limited this event but is hoping that other vets will replace those who originally participated. In this way, Standing Rock water protector camps will have a constant presence of veterans to help protect them as they face the Morton County law enforcement and their violent opposition to their prayers. In a moving ceremony attended by over 500 veterans from all branches of service, Clark Jr. made a formal apology to Leonard Crow Dog, revered Lakota medicine man and spiritual leader, for the centuries of genocide that the US military has committed against indigenous tribes. So appropriate and long overdue.Thank you Wesley Clark Junior for speaking the words that I have often wished to say myself but haven’t had the opportunity to do so. I ask forgiveness as well. So many of the world’s problems could begin to get better if we did the same meaningful gesture to our other brothers and sisters we took as slaves, or the innocent people we massacred out of fear from the lies about weapons of mass destruction, just to name a few. Wouldn’t it be nice if we had a holiday for reconciliation? Perhaps December 5th could be that day, from now on.